Select 10 different minerals. For each one, name a product for which the mineral is used. Explain the role mining has in production and processing things that are grown. From the list of minerals you chose for 1a, determine the countries where those minerals can be found, and discuss what you learned with your counselor. The miner's personal protective equipment is worn and used, including a hard hat, safety glasses, earplugs, dust mask or respirator, self-rescue device, and high-visibility vest. Miners protect their hands and feet from impact, pinch, vibration, slipping, and tripping/falling hazards. Monitoring equipment warns miners of imminent danger, and how robots are used in mine rescues. With your parent's approval and your counselor's assistance, use the Internet to find and take a virtual tour of two types of mines. Determine the similarities and differences between them regarding resource exploration, mine planning and permitting, types of equipment used, and the minerals produced. Discuss with your counselor what you learned from your Internet-based mine tours. With your parent's permission and counselor's approval, visit a mining or minerals exhibit at a museum. Find out about the history of the museum's exhibit and the type of mining it represents. Give three examples of how mineral resources have influenced history. With your parent's permission and counselor's approval, visit an active mine. * Find out about the tasks required to explore, plan, permit, mine, and process the resource mined at that site. Take photographs if allowed, and request brochures from your visit. Share photos, brochures, and what you have learned with your counselor. With your parent's permission and counselor's approval, visit a mining equipment manufacturer or supplier. * Discuss the types of equipment produced or supplied there, and in what part of the mining process this equipment is used. Take photographs if allowed, and request brochures from your visit. Share photos, brochures, and what you have learned with your counselor. Discuss with your counselor two methods used to reduce rock in size, one of which uses a chemical process to extract a mineral. Explain the difference between smelting and refining. Learn about the history of a local mine, including what is or was mined there, how the deposit was found, the mining techniques and processes used, and how the mined resource is or was used. Find out from a historian, community leader, or business person how mining has affected your community. Note any social, cultural, or economic consequences of mining in your area. Share what you have learned with your counselor. Choose a modern mining site. Find out what is being done to help control environmental impacts. Share what you have learned about mining and sustainability. Explain reclamation as it is used in mining and how mine reclamation pertains to Scouting's no-trace principles. Discuss with your counselor what values society has about returning the land to the benefit of wildlife and people after mining has ended. 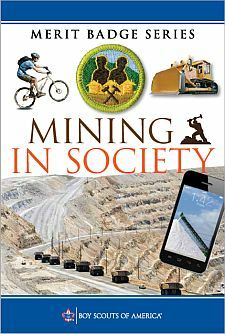 Discuss the transformation of the BSA Summit Bechtel Family National Scout Reserve from a mine site to its current role. Explore the anticipated benefits of interplanetary mining. Learn how NASA and private investors may search for, extract, and process minerals in outer space, and the primary reasons for mining the moon, other planets, or near-Earth asteroids. Find out how exploration and mineral processing in space differ from exploration on Earth. Share what you have learned with your counselor, and discuss the difficulties encountered in exploring, collecting, and analyzing surface or near-surface samples in outer space. Identify three minerals found dissolved in seawater or found on the ocean floor, and list three places where the ocean is mined today. Share this information with your counselor, and discuss the chief incentives for mining the oceans for minerals, the reclamation necessary after mining is over, and any special concerns when mining minerals from the ocean. Find out what sustainability problems arise from mining the oceans. Discuss what you learn with your counselor. Learn what metals and minerals are recycled after their original use has ended. List four metals and two nonmetals, and find out how each can be recycled. Find out how recycling affects the sustainability of natural resources and how this idea is related to mining. Discuss what you learn with your counselor. With your parent's permission, use the Internet and other resources to determine the current price of gold, copper, aluminum, or other commodities like cement or coal, and find out the five-year price trend for two of these. Report your findings to your counselor. With your parent's and counselor's approval, meet with a worker in the mining industry. Discuss the work, equipment, and technology used in this individual's position, and learn about a current project. Ask to see reports, drawings, and/or maps made for the project. Find out about the educational and professional requirements for this individual's position. Ask how the individual's mining career began. Discuss with your counselor what you have learned. Find out about three career opportunities in the mining industry. Pick one and find out the education, training, and experience required for this profession. Discuss this with your counselor, and explain why this profession might interest you. With your parent's permission and counselor's approval, visit a career academy or community college to learn about educational and training requirements for a position in the mining industry that interests you. Find out why this position is critical to the mining industry, and discuss what you learned with your counselor.